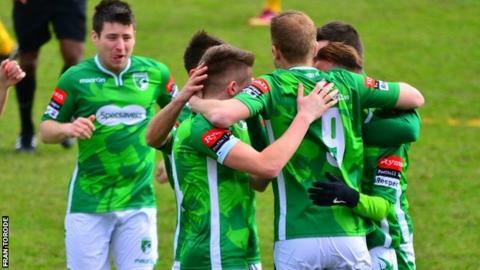 Guernsey FC won for the sixth time in their last seven games as they beat bottom-of-the-table Horsham 2-1. Marc McGrath scored the quickest goal in club history as he gave the Green Lions the lead after just 15 seconds. Dave Rihoy doubled the advantage from close range just after half-time before Tony Nwachukwu scored a penalty after he was brought down by Chris Tardif. The result moves Guernsey, up to 10th in Isthmian League Division One South. Guernsey are 10 points behind Whyteleafe, who occupy the final play-off spot, but have a game in hand. Their only defeat this year has come at unbeaten league leaders Burgess Hill Town as the Green Lions recover from their worst run of results in club history. Guernsey had won only two of 14 league matches between mid-September and mid-December.